Wind: Light all day. Max 12mph. from Avenal MAT 565 Weather Underground Station. XCSOAR glide computer reported wind at 4 kts. from 056 deg. while thermaling at 4000 ft. MSL over the field. 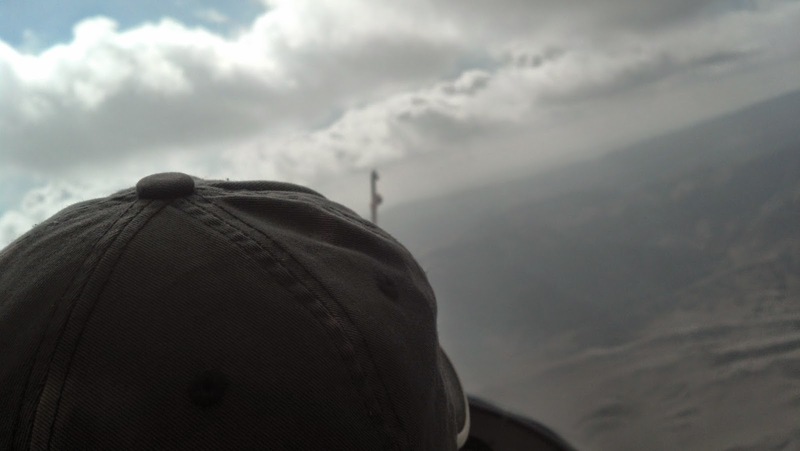 Altitudes: 5000ft MSL plus. Andrew Oullet and Jan Zanutto near Black Mtn. Max Lift: 4 kts near Avenal Airport. Up to 6 kts. near Black Mtn. Temperature: Maximum 67 deg. F. from the Avenal MAT 565 Weather Underground Station. 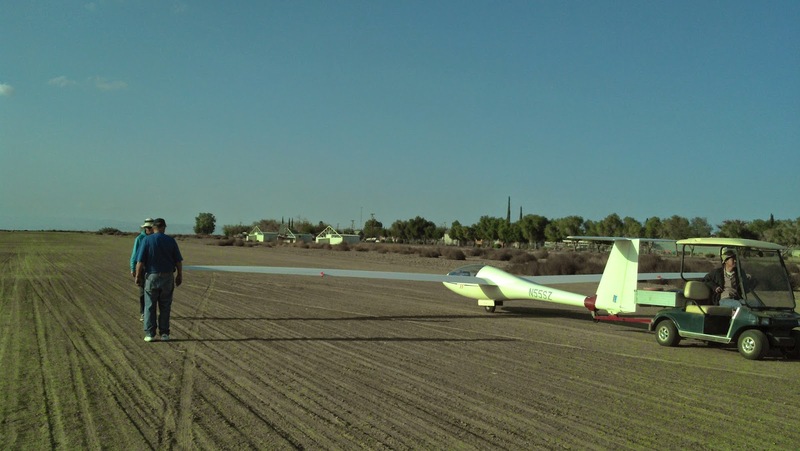 Comment: Highlights: Andrew Oullet has first flight in SZD 55. Visiting pilot Jim Murphy from Puget Sound Soaring Association. 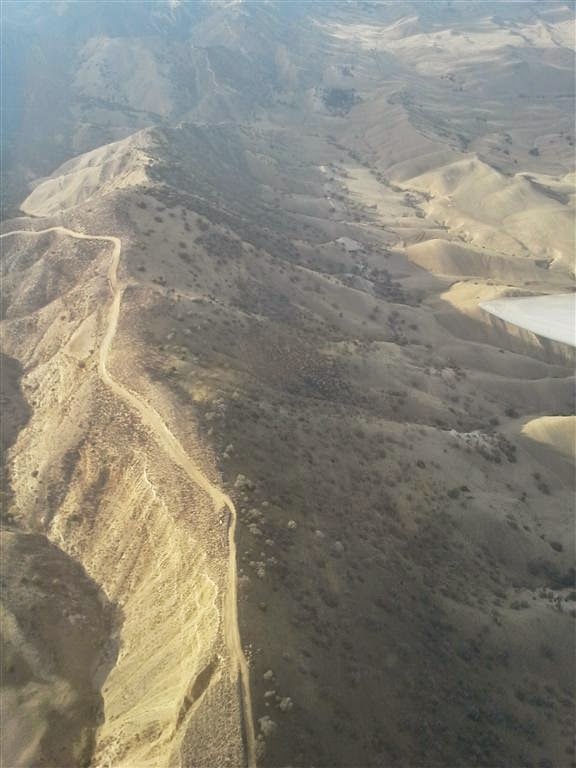 Jan has exciting flight in DG on backside of Tar Canyon. Tow pilots Chris Reilly and Jim Rickey checked out by Dan Gudgel. There was a tremendous amount of activity going on at Avenal today. 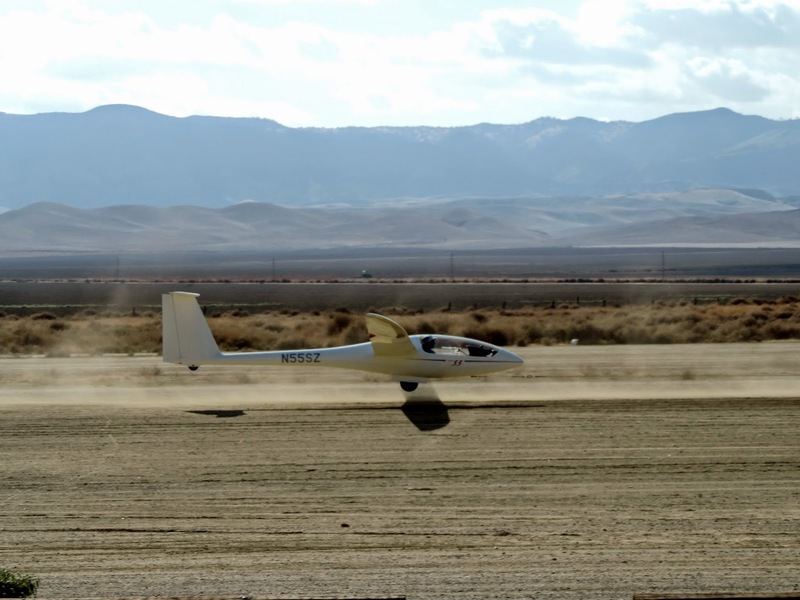 It was a beautiful day, with good soaring conditions. Beautiful cumulus clouds were popping by 10:00 am over the field, and over the mountains, with good lift from 10:00 am until late afternoon. Chris Reilly was checked out as a tow pilot by Dan Gudgel in the morning. Sorry, I didn't get any pictures of that. Peter Mersino and Harold Gallagher flew out from Chandler in the Piper. Jeff Richardson worked with Martin all day in the South Hangar. Martin's good friend Dennis was over in his Piper Taildragger, in which he has installed an FLARM! Jan Zanutto was out flying the DG and marking thermals for Andrew Oullet, who took delivery on a beautiful SZD 55, and made his first flight in the ship today. Andy Reistetter was out working on his Russia. I didn't see him fly. I had been concerned, as he has been saying he would like to sell the ship, but I was relieved to hear today that he plans on remaining in the club and flying more in the club ships. Jim Murphy, from the Puget Sound Soaring Association visited today and flew with Alex for 1.8 hours in the Orange Crush. Looking West towards Black Mtn. from about 4000 ft. MSL. Jim earned his private glider rating this summer at the Puget Sound Soaring Association. Most of his flying up there was on their ridge, so he got in some good practice at thermal flying today. We told him the weather is ALWAYS like this at Avenal year round ;-). He may be moving to San Luis Obispo in about a year, so we hope he'll be back soon. Cumulus cloud shadows over the Kettleman Plain near Avenal from about 4000ft. MSL. Jim Murphy discussing soaring with Frank Owen, our tow pilot for the day. "Hi Alex,Thanks again for the time aloft, I loved the flight and the conversation. The experiece thermaling was great. I sent the pictures in a separate email... not the best selection but c'est la vie. Hope to be back out to fly with CCSC again sometime in the near future. I need to retire and fly more. " "Hey Alex. Attached are 2 photos. I got to 5000 over black. I started over the ridge after releasing at 2500. Jan had some nice lift picked out for me while on tow. After climbing to 5k, I shot down south along the ridge and then followed the 41 to the 33 and then back to the mountains. It's a different feeling knowing I can make it back to the airport in areas and altitudes that would have given me anxiety in the 1-26. I am very impressed with how the SZD-55 flies. It's a very easy glider to fly, I was able to be hands off for a good amount of the straight glides. Holding airspeed constant while rolling in and out of thermals will take a few more flights to really get dialed in compared to the 1-26 because it picks up speed so easily. Can't wait for the next flight! Andrew on Wingtip as SZD-55 is towed in following Andrew's first flight in the ship. Andrew and Jan's GPS flight tracks for their flights today. A beautiful sky and a beautiful ship. Andrew approaches Black Mtn. 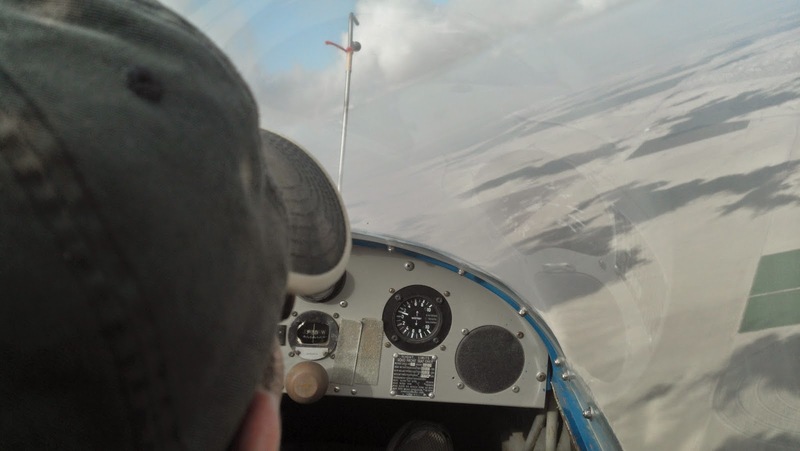 from the South in the SZD-55 on his first flight in the ship. "I didnt even install my flight computer yesterday, I figured I would just take whatever lift was there and stay local. It was kinda nice not having to set up the cockpit with all the usual accouterments. I got 2.5 hours in, and max height was almost 4500 over tar. As you can see I stayed around the ridge and the valley. I included a close-up picture of one section of my flight that I'd like to pass on as a learning experience. Finding lift yesterday was somewhat predictable, as there were a lot of clouds covering the hills and Black mtn particularly. The areas of the ground that were in the sun and facing the sun produced lift as could be expected. Black mtn got a little overdeveloped as the day went on. I was at the power lines working a thermal and steadily drifting west with the thermal as it was pushed by the wind. In the valley west of the power lines there was sun, and Andrew was higher and farther west than I was so I made a decision to push out over the valley and try to get into the same lift that he was in. Things changed a bit, and there was lots of 800fpm sink out there and it didnt take long to realize I had initially pushed west a little too low and didnt leave myself a good enough margin to get back to the last known lift if this move didnt pay off. I realized I had basically two options. I could either hug the descending terrain and run back south, hoping to pop through the gap at tar canyon, or I could hug that same terrain and follow it as it descends and eventually arrive at the flat lands and a road as far south as I could stretch it safely and find a landout spot. One thing I did was immediately call Andrew on the radio and advise him I was low and spot my position as he would be the only person who knew where I was. He had a visual ID on me and said he'd keep and eye on me. I stayed as close to the terrain as I safely could and got quite a few nice bumps and zero sink areas which really stretched out my glide. There was absolutely no turning to circle at this point. I was getting lower with the terrain as it descended. Thankfully, so thankfully plan A was working and what seemed like an eternity of having terrain higher than me on both sides finally gave way to the backside of Tar and the Tar gap appeared. 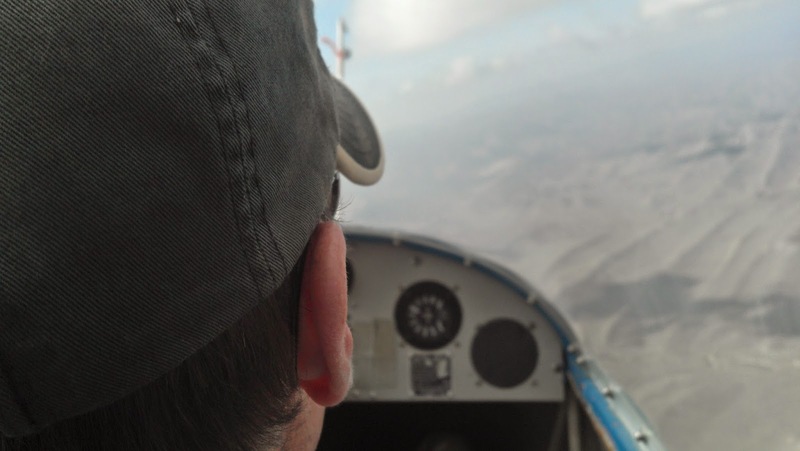 I popped through the Tar gap and could see that I had a visual final glide back to Avenal. I was greeted by a good size flock of birds- a very welcome sign and I turned into their lift and was able to climb back up and salvage the flight. Looking back now I am surprised at how calm I stayed in the cockpit and had the sense to call Andrew to let him know where I was, and also to establish and stay at best L/D speed to maximize my glide out of the canyons. I'm sure there would have been a landable spot to the south but I'm glad I didnt have to exercise that option. The rest of the flight was pretty fun." Jan's comment: "about 4500 over Tar. notice the sun on the west side. thats where lift was"
Blogger comments on Jan's flight: We have had two other instances in the club I can recall where people got trapped on the back side of the ridge with no lift, and too low to get over the ridge and back to Avenal. One incident was in the Blanik a number of years ago, and another one was in the 1-26. Both pilots in those instances took pretty much the only option available as Jan did, they headed South into the Sunflower Valley, and followed the lowering terrain. With the lower glide ratio of those ships compared to Jan's, shooting through the Tar Canyon Gap, as Jan did, was not an option. They both made successful off field landings in somewhat low rolling hill like terrain at the North end of Sunflower Valley. Thankfully, the terrain in that area is relatively benign. The Sunflower Valley gets even flatter further South towards Hwy 41, and there are some roads one could probably even land on. However, with the lower glide ratio ships, in our two incidents, they ran out of altitude while still over somewhat hilly terrain at the North end of the Sunflower Valley. But fortunately and luckily, not due to any good planning, since I believe in both cases, the pilots made straight in approaches and took whatever they happen to have had in front of them when they ran out of altitude, the terrain there is relatively free of obstacles. 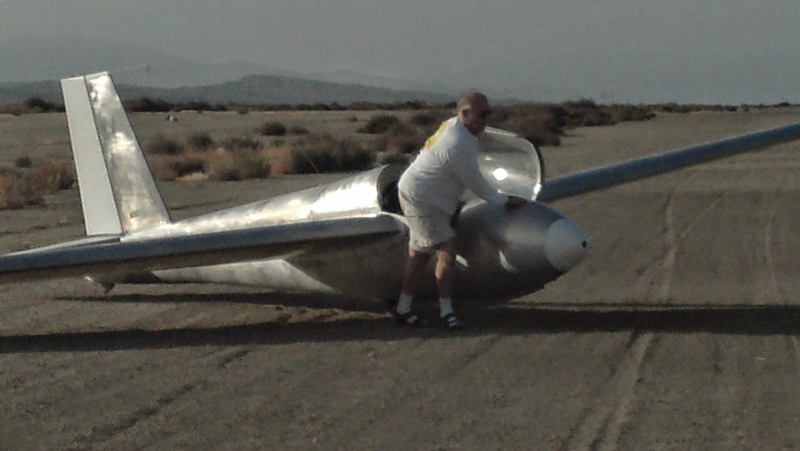 The end result was no damage to the gliders or pilots. The lessons are 1. Don't get in that situation where you are too low out there and get on the back side of the ridge. 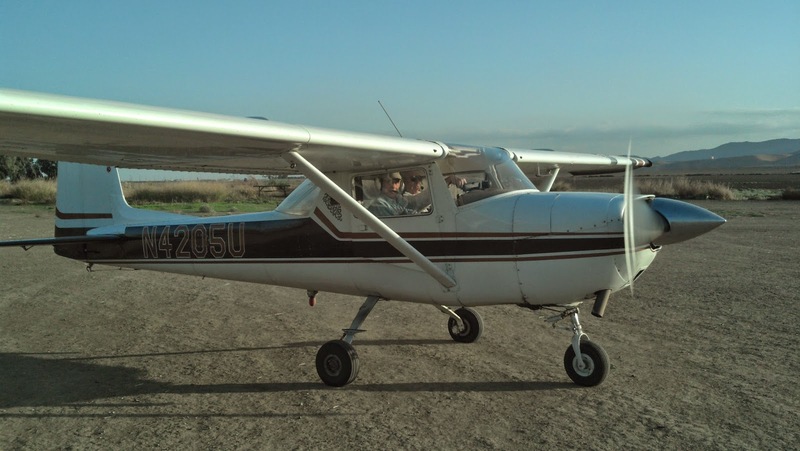 The 1-26 would be lucky to get back to Avenal Airport from the ridge top height at Tar Canyon. 2. The good thing our land out pilots did once they realized they had made mistake No. 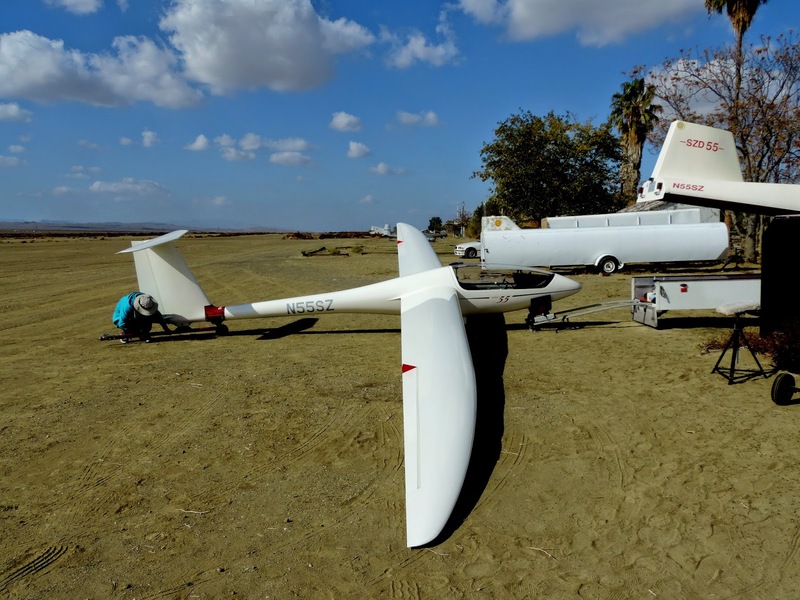 1, was to keep their gliders flying, not letting their glider get slow and stalling or spinning in from a low turn trying to thermal, or trying to make a turn at low altitude. 3. Tow pilots should never tow a 2-33 or a 1-26 out past the ridge line, even if the pilot takes a very high tow. This is one factor in the 1-26 incident. He took a high 4000ft. tow, but was taken considerably out west beyond the ridge line. When he released, he did not find lift right away, and encountered sink. He was quickly below ridge top height, unable to get over the ridge from the backside and back to the airport. Jim Rickey man handling the 1-26 after his landing. 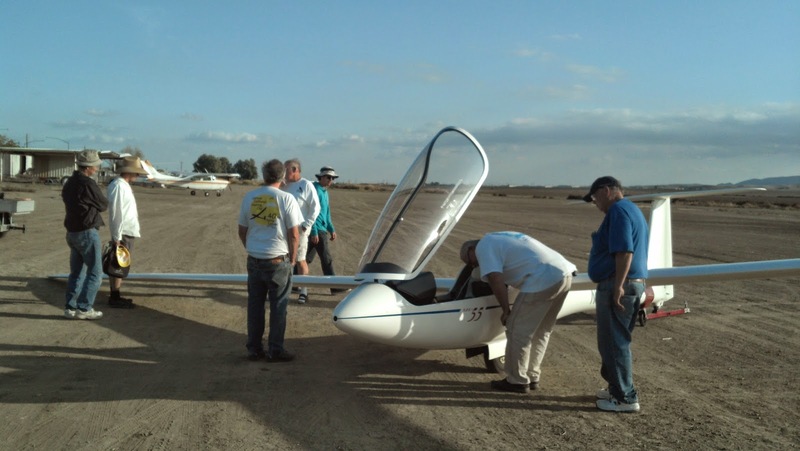 Everybody checking out the SZD 55 following Andrew's flight. End of day panorama to the North. Cumulus clouds had pretty much dissipated, having morphed in to a kind of stratus-like layer over the mountains. Later some lenticular like clouds were seen over the mountains to the West and North West just at sunset. 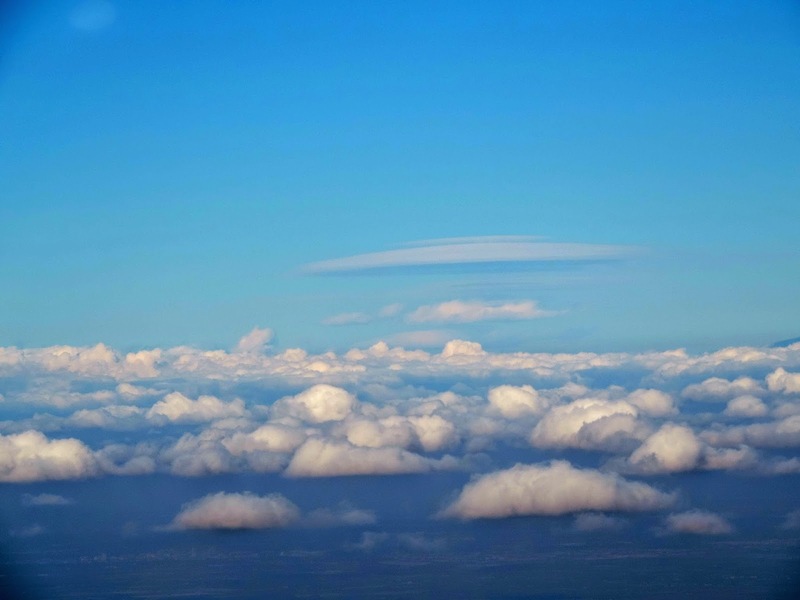 Thanks to Harold for this photo of a lenticular over the Sierras while Harold and Peter were flying back to Fresno. Panorama to the South at the end of the day. Dan has organized the North Hangar . He spent much of the day working in there when he wasn't flying checking out tow pilots Chris Reilly and Jim Rickey. 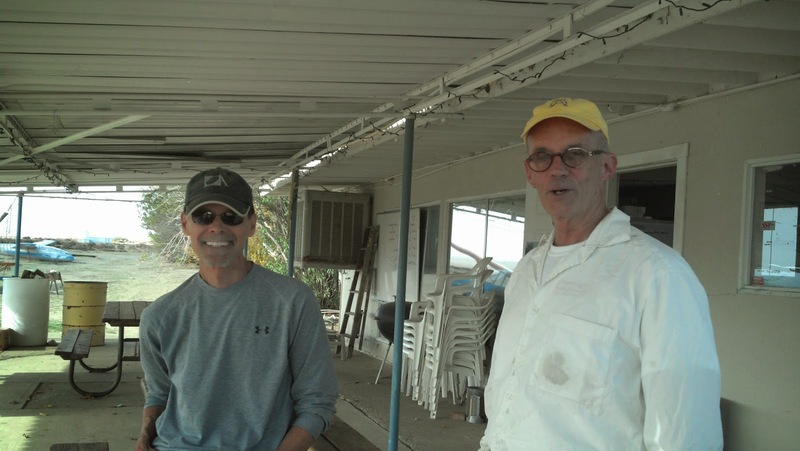 Dan Gudgel and Jim Rickey during Jim's tow pilot check out. 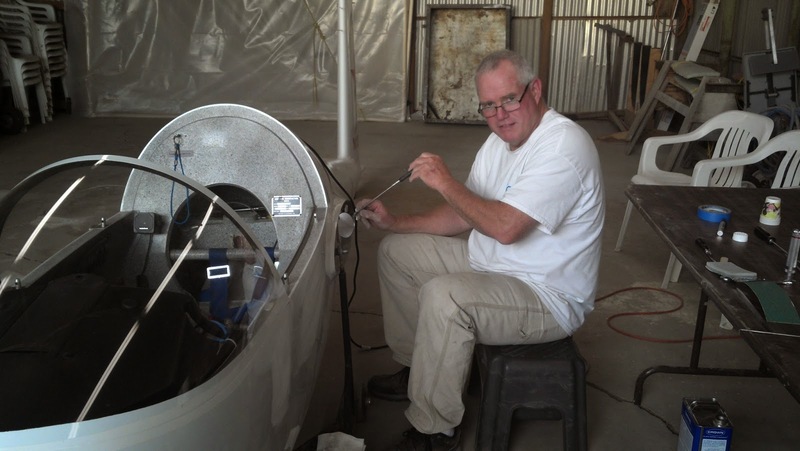 Martin Caskey working on spar box repair on Larry Johnson's Russia. The South Hangar looks beautiful, complete with lighting, thanks to the work of several hard working volunteers. The day was unusually good for this time of year. Morgan had indicated there might be post frontal conditions today in an email sent out during the later part of the week. The synoptic scale picture was that we were on the back side of a slowly exiting trough. A disturbance, I believe a "short wave trough" had moved through late on Friday, and was exiting S. Calif. during the early part of the day. This synoptic pattern can be seen well on the WV loop from the Nex Sat site included below. This improved the lapse rates for soaring today, and brought in just enough moisture for the Cu's we had today, but not enough for any over development. There were some strong winds in the desert areas to the South of us, and off shore, but the winds in our area were generally light. The Skew - T forecast for Avenal from the RASP is instructive. It predicted lift to 4000 MSL right over the field at 1400 PST which is exactly what we got. Also the Cu Cloudbase where Cu Potential > 0 was forecasting Cu's at 1400 PST about 4500 ft. MSL over the airport, and up to 5000ft. over the mountains, which is also just what we got. .UPDATE...UPDATED AIR QUALITY ISSUES SECTION. NEAR TO SLIGHTLY ABOVE NORMAL THIS WEEKEND INTO EARLY NEXT WEEK. THURSDAY THEN PERHAPS ANOTHER DISTURBANCE BY FRIDAY. WILL PREVAIL OVER THE CENTRAL CA INTERIOR FOR THE NEXT 24 HOURS. BY THE NATIONAL WEATHER SERVICE SAN JOAQUIN VALLEY - HANFORD. INFORMATION AND/OR TO PROVIDE FEEDBACK. November 8, 2014; No lift.